Santander is a cruise and ferry port so visitors are often here for a day. If you are visiting overnight hotels are good value compared to other Spanish cities. Magdalena Palace is known in Spanish as the Palacio de la Magdalena. The palace was built in the early 20th century for the Spanish royal family. The palace and the Magdalena peninsula were exclusively used by the royal family. In fact the Magdalena peninsula was a gift to the royal family from the city of Santander. In 1977 the palace and peninsula were sold back to the city of Santander. The palace is now used for conferences and meetings. It’s the most visited site in Santander. Santander is not such a popular place so you’ll be able to take beautiful pictures of the palace without people in them. The Magdalena peninsula is an interesting place to walk around. Of course the thing to see on the peninsula is the Magdalena Palace. You will see wonderful views of the oceans and surrounding bays. There are beaches surrounding the peninsula. If you are visiting Santander with kids, they will love the peninsula. 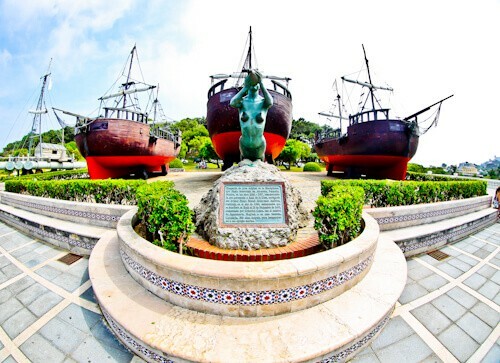 A notable point of interest on the peninsula are the 3 galleons. These galleons were used by the famous Cantabrian sailor, Vital Alsar. Vital Alsar used these galleons to sail from Spain to Mexico. He should open a website called ‘Only by Boat’! If you were to mention Santander to a friend they would think you were talking about a bank. In the city of Santander you would expect to see a grand Santander bank. The Santander bank building doesn’t disappoint. Through the grand archway of the bank is Porticada Square. There is no historic old town of Santander as it was destroyed in a fire in 1941. Santander had to be rebuilt and Porticada Square became the main square and center of the city. The square is also called Pedro Velarde Square. It’s named after a famous Cantabrian liberator from the 19th century. Centro Botin is an example of modern architecture on the Santander promenade. The Centro Botin was designed by Italian architect Renzo Piano. It is built on stilts so it does not block the view of the sea. 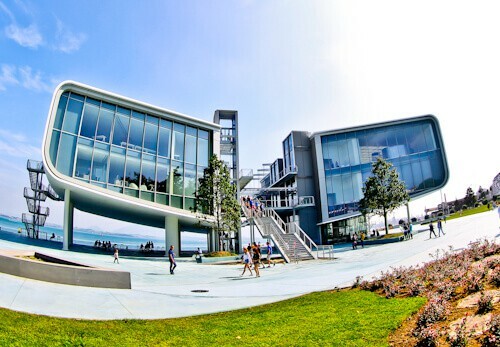 You may ascend to the roof which gives wonderful views of the bay and city. Inside there is an art gallery and wonderful views from the huge windows. 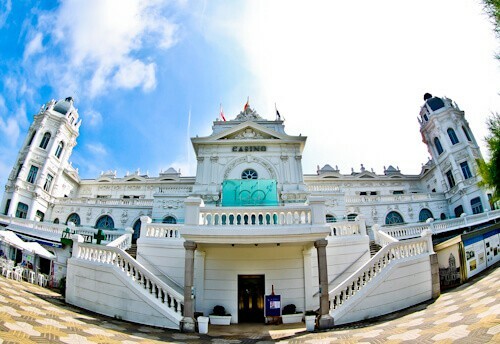 The Gran Casino del Sardinero is a grand casino as the name suggests! Back in the day its clients included royalty. 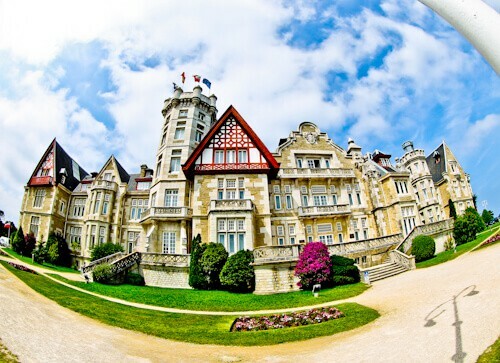 The building you see today is over 100 years old and is one of the grandest in Santander. 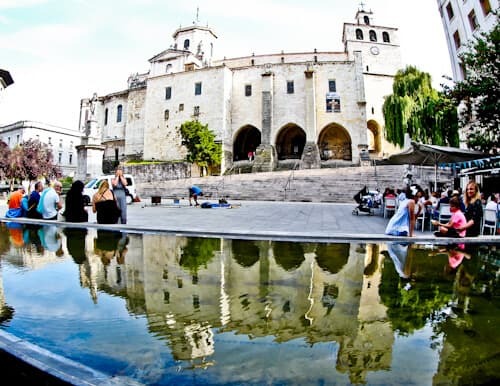 It’s located in the Plaza de Italia. 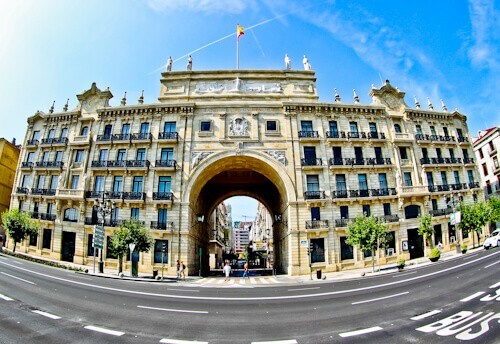 If you walk to the center of Santander via Paseo Menendez Pelayo you’ll see many more grand buildings and mansions. 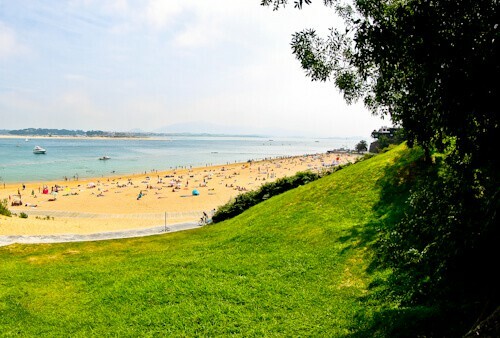 Santander is perfect for beach lovers. Being located in the north of Spain it doesn’t get too hot either. There are beaches within walking distance of the center. The beaches are located on each side of the Magdalena peninsula. One of the beaches is called Bikini Beach! Santander has its own Gothic cathedral. The cathedral dates back to the 12th century and was built on top of what was Santander Abbey. You can take a good reflection shot of the cathedral from the pond in front of it. It would be better to take this shot at night or early morning. This would guarantee there were no people sat around it enjoying their tapas. Around the cathedral you’ll find many high street shops and restaurants. A good value tapas bar I can recommend is 100 Montaditos. A beer which goes well with the climate of Santander is a Cruz Campo Glacial. 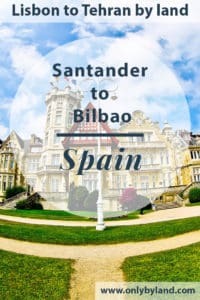 The bus from Santander to Bilbao takes around 90 minutes. The buses are direct and you can book online. 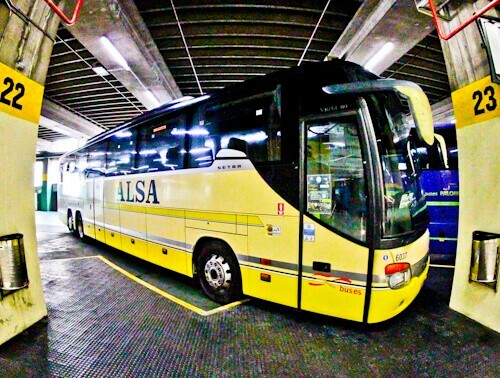 You could walk into the conveniently located bus station in the center to buy your ticket to Bilbao. The buses leave roughly every half hour so you won’t have to wait very long. I have a great love affair with Spain, but never made it to Santander. After reading this, I really want to go! The palacio and the other architectural buildings are gorgeous, are is Centro Botin. It’s an incredible modern building. Maybe for a future idea, you should do ‘Only by Sea’; it’ll keep you travelling forever! I’ve never been to Santander but it looks lovely. You’re right, the banks did not disappoint! It looks like there is a bit for everyone from beaches to historic buildings. Adding to my bucket list, thanks! Thanks for giving me all these info about Santander. My daughter worked there on a computer project for a few months. I didn’t visit her. Now I regret that decision. And it is so near Bilbao! I haven’t been to Spain yet, but I desperately need to go! It’s much too beautiful to not see in person! I particularly loved Centro Botin and I definitely need to make my way over to Santander to see it! Thanks for sharing! I thought that Barcelona had amazing architecture. But I didn’t know that Bilbao had some exemplary architectural features as well! Love the modern architectural style of Centro Botin. And Palacio de la Magdalena is an absolute beauty! Wow I am loving the vibrancy of the architecture and how if changes from the historic to modern. The photos are as always a pleasure. I’ve never looked at Santander as a holiday option but I see it in a different light now. The Casino look grand, but the modern Botin is a favourite of mine as does the Magdalena Peninsula which looks pretty awesome. This is one part of Spain I haven’t been to but I would so love to go! The architecture and the beaches look amazing :D. I never realised how close Santander and BIlbao are before. Huh, I’d never connected the idea of Santander Bank to a real place! That would be a cool photo op lol. I would love to go back and explore more of Spain one day–I haven’t been north of Madrid. Looks like some great places to add to the list! Centro Bolin and the beaches would be first n my list to see. I love reading posts likes this that bring out little known treasures from Spain. the city looks amazing and fun place to spend a weekend away! Ooh you’ve introduced me to a new town! Love that old grand casino! Santander looks so charming! The palace and whole Island that used to belong to the royal family would be a very special place to visit. The Centro Botin certainly is a unique structure and I think they succeeded in not blocking the view of the bay! Santander looks interesting and charming. Another new town for me to visit on my next visit to Spain. Great photos and list of the interesting places to visit there. The Santander Cathedral looks interesting and makes a great photo shot. How fun they have a casino! I pinned for later! My bank is Santander and I knew it was a place in Spain but didn’t realise a trip to “head office” meant I could stop by Bikini Beach on the way back! What a lovely city with beautiful architecture, the gothic cathedral is gorgeous. Pinned! Looks like a great place to visit – a combination of beautiful classic architecture with modern buildings. Heard many good things and would love to visit – have never been to Spain though so definitely one to add to the list. Great pictures! I think shots made with a wide-angle lens always look so professional and neat. And as always – great guide! Centro Botin looks like a fascinating piece of architecture. Love the use of Wide angle lens, I really need to invest in one for myself.